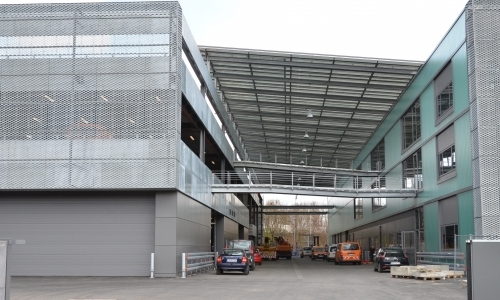 The car park was constructed when building the new technical operating centre for the central department of Civil Engineering of the City of Munich. The premises comprises the “warm house” including the administration, several workshops, a high rack warehouse and the traffic control centre and the “cold house” with parking decks with 149 spaces for trucks an passenger cars, a crane and a storage hall, as well as the open-air storage area. There is 1.700 m² space for truck and 4.500m² space for car parking positions on three parking levels. The main structure consists of a steel/concrete-composite skeleton structure. The bracing system consists of staircases in reinforced concrete structure and steel cross bracings. On ground floor the car park is closed on all sides. It has to be frost-free, i.e. there has to be a temperature of 5°C or higher. Above the storage area the composite ceiling and the composite columns had to be constructed in fire protection class R90.